The Angriest: Star Trek: Voyager: "Investigations"
It is 13 March 1996, and time for another episode of Star Trek: Voyager. Finding his position on Voyager untenable, Tom Paris (Robert Duncan McNeill) resigns his commission to join a Talaxian freighter. 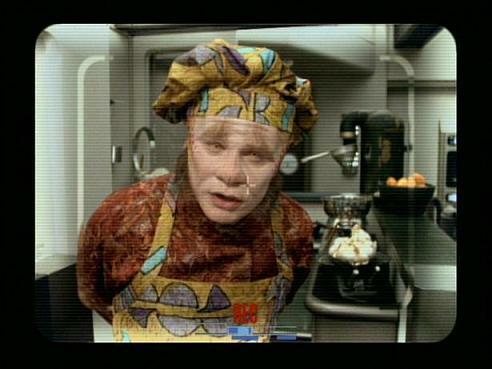 Neelix (Ethan Phillips) begins broadcast a daily news show to the crew, which leads him to suspect someone is sending unauthorised communications to the Kazon Nistrim. After weeks of Tom Paris increasingly acting like a selfish idiot, Star Trek: Voyager turns the tables with the revelation that it was all an act: Tom's apparent playing-out was a ruse to enable Captain Janeway (Kate Mulgrew) and Lt Tuvok (Tim Russ) to identify the mole leaking intelligence to the Kazon. While it is good to see Star Trek embracing longer-form storytelling, it ultimately does not worth very well. A for effort, but C for conclusions, I guess. There's a cringe-worthy scene halfway through where Janeway explains the ruse to an understandably flummoxed Commander Chakotay (Robert Beltran), who was kept out of the loop entirely. No wonder he's confused and annoyed - it beggars belief that the ship's first officer would not be informed of something so important. Paris' capture by Seska (Martha Hackett) and the Kazon is also weirdly unsatisfying, because it really does not feel as if it leads anywhere remotely interesting enough to justify the weeks of aberrant behaviour on Paris' part. Back on the ship there's some action involving Ensign Jonas (Rafael Sbarge) growing increasingly paranoid that his treachery is going to be found out, and Neelix's attempts at citizen journalism bringing him closer and closer to being the one that identifies him. It's a weird episode for Neelix: some of the material is excellent, particularly the action-packed climax, but the beginning and ending that focus on his awful attempts at breakfast television at just painful to watch. The goal for this episode, creatively-speaking, is clear. The end results, however, simply miss the mark by too wide a margin. It is an episode that is enjoyable in fits and starts only, and a much more accomplished version would not have been hard to achieve with a little forethought. It's a swing and a miss for "Investigations", leaving Season 2 with 12 good episodes out of 20 and a quality ratio of 60 per cent.